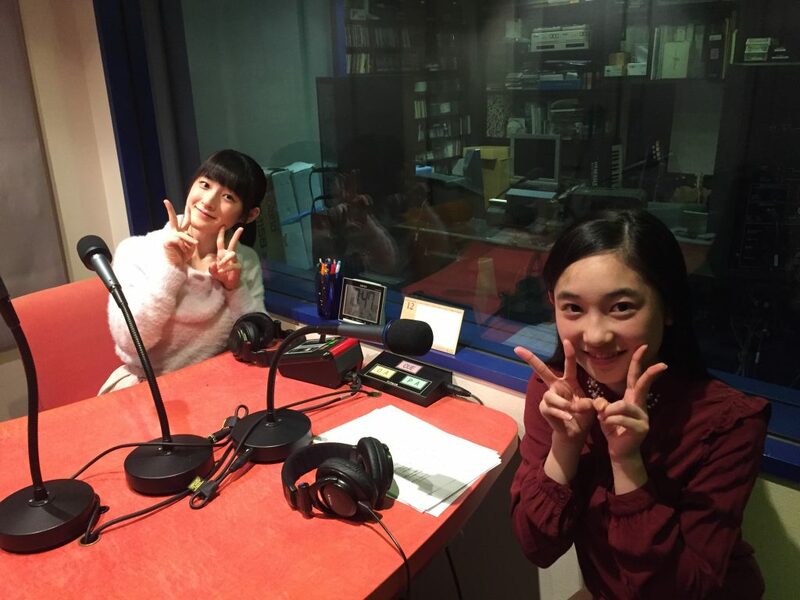 We’ve got a full house for Yanamin’s last appearance on this radio show! 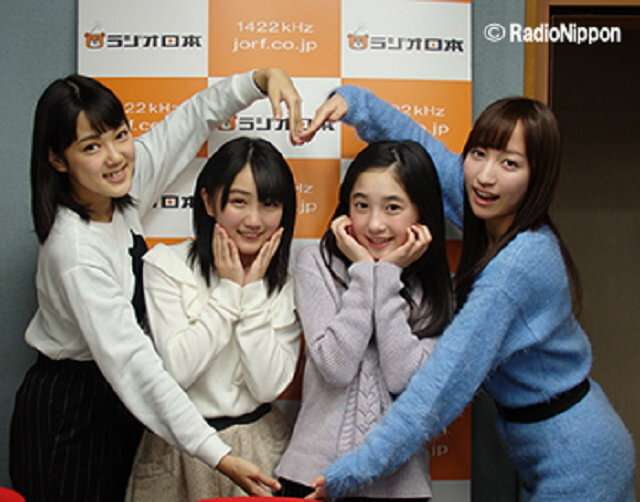 For the record, this is the first and last time that this 8 member line-up are all together on this radio show. Over these two years, Yukanya has been continuously taking photos of Yanamin. There are times when Yukanya asks for permission and there are times when she tries to take some sneak shots, but her attempts to do the latter are often noticed by Yanamin. When Yukanya looked back at her many pictures of Yanamin, Yanamin would be looking towards the camera, even in the ones that Yukanya had tried to take stealthily. Miyazaki: Maybe she’s always on alert? Regardless, Yukanya is happy that Yanamin always gives her a cute look. Eventually, things have gotten to the point where Yanamin instead asks Yukanya to take photos of her. There was a point in time where Juice=Juice was really into the werewolf game. During a three-and-a-half hour trip back from Hokkaido, Yanamin pleaded for ‘Just one more game! One more game!‘ Back when they had just five members, they’d just do two or three rounds. But the relentless assault of Yanamin’s cuteness led to them playing on and on the whole trip long. Yanamin’s really grateful that they put up with her selfish requests when they were likely exhausted after their live performances. Carrying over from the AS1422 that aired immediately prior to this show, Yanagawa Nanami answers Katsuta Rina’s question: Mention three good things about her Kenshuusei generation-mate, Kasahara Momona. First: The huge contrast between Kasahara’s looks and when Yanamin talks with her. Despite looking more mature than Yanamin, Kassa’s actually two academic years lower. But when Yanamin speaks with her, she finds that Kasahara still has a kind of cute childishness to her. Second: She’s strange. Her unique way of thinking impresses Yanamin sometimes. Third: Her atmosphere. She brings out this warm, airy atmosphere that soothes those around her. Yanamin enjoys and treasures the times that she spends with Kassa. We start with Yanagawa Nanami and Funaki Musubu, who thank ANGERME for passing on the baton! Speaking about ANGERME, Yanamin asks Funakki if she has any stories with an ANGERME member that she’d like to share. Well, ANGERME’s Sasaki Rikako is one of Funakki‘s favourite senpai. Rikako is really cool, and the other day, Morning Musume。´16’s Makino Maria-san suddenly sent Funakki a video of Rikako sneezing. Funakki takes this opportunity to thank Makino-san. How about Nanami? Her story is from back when she was still a Kenshuusei, when she was participating in the 2015 summer Hello! Cons. Murota Mizuki-san was hiding in the wings of the stage, and jumped out to surprise Yanamin. Yanamin found it really adorable, and this cute Murotan-ish incident was quite memorable for Yanamin. This 50th episode was kicked off with by the two new members. Both of them were nervous, but Funakki learnt from Yanagawa-san’s politeness. Continuing on from last week, the remainder of this episode will come from the latter part of their 3rd March recording at Club 333 in Tokyo Tower. But before that, here’s a song from their new release! Yanagawa Nanami and Funaki Musubu start off this broadcast, straight off the heels of AS1422. Funakki asks Yanamin if she’s close to any of the ANGERME members, or if she has any stories to share that involve an ANGERME member. Yanamin feels close to Kamikokuryo Moe, who joined H!P around the same time that they did. 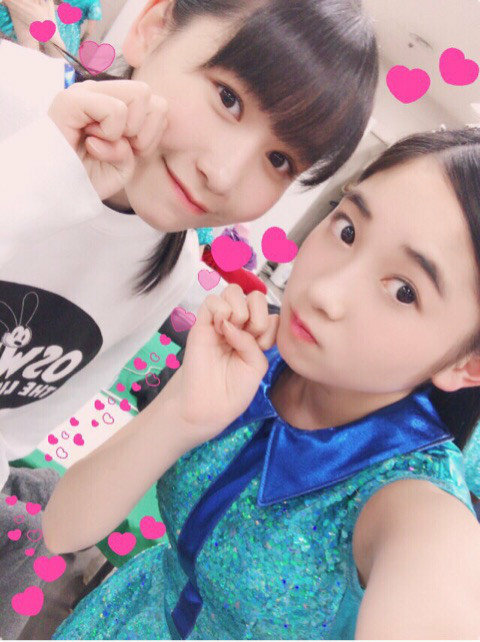 She often sees Musubu and Kamiko-chan talking with one another as well, to which Funakki herself admits that she is quite chummy with Kamiko-chan. They hung out a while back, and even bought matching clothes. Yanamin hopes that the three of them can hang out next time, as she was unable to join them on that day due to a fever. From her voice, Funakki suspects that the listeners can tell how nervous she is about having to take the lead for the opening of this episode. 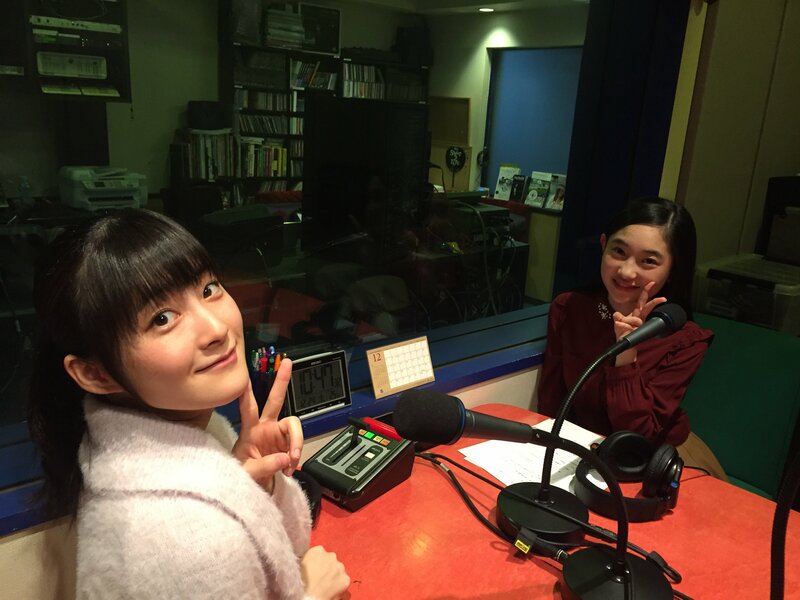 Yanamin‘s also nervous because it’s just the two of them starting off the radio programme, and while they’re used to working with one another, on radio, they’re only able to convey their thoughts through their voices. But she’d like to do her best. The two of them had been guests on the show before, but back then, they had their senpai Risa and Ozeki to fall back on. But this time it’s just the two of them, so Funakki’s at maximum nervousness. 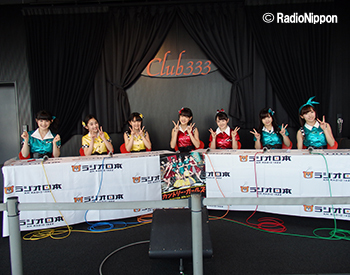 The rest of today’s broadcast was actually recorded on the 3rd of March (Thurs) at the special stage of Club 333, in the main observatory of Tokyo Tower, where all seven members made an appearance! But before that, here’s the first number! At the training camp period during the auditions, Yamaki had many opportunities to interact with Kamiko-chan as well. So even though she’s just joined, Yamaki feels that she’s quickly gotten used to her. The two girls agree that Kamiko-chan’s really tiny and adorable, yet she has this calm atmosphere to her. Looks like another lovely member has joined Hello! Project. 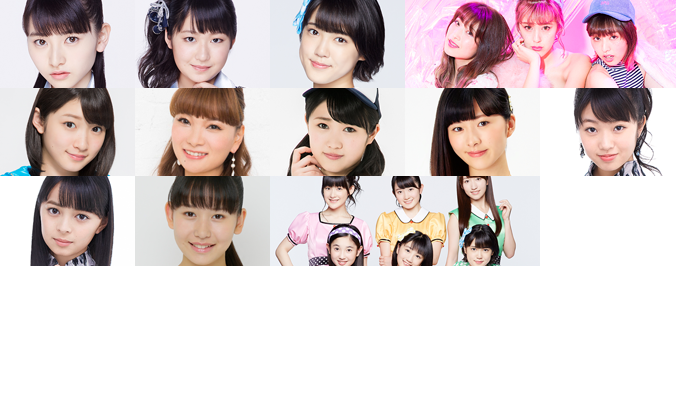 And speaking about new members, the girls introduce their guests for this week: continuing on from last week, they welcome Country Girls’ new members Yanagawa Nanami and Funaki Musubu! We start with an introduction from Yanamin. She feels like she’s gotten a bit more used to being on radio after her appearance last week, so she’d like to do her best to be more proactive with talking. Next is Funakki. She had also been on the show last week, and hopes that she’ll be able to engender a good mood as a member of Country Girls. Now that the two new girls have gone through the New Year Hello! 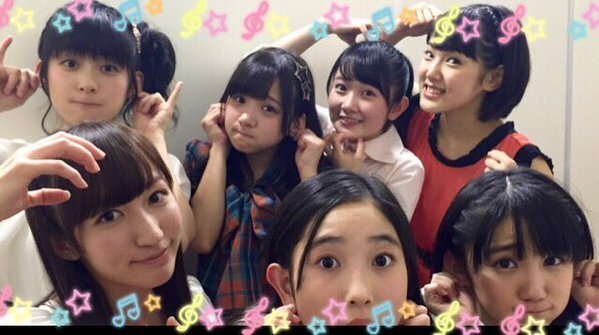 Con rehearsals with the rest, Yamaki asks if they’ve gotten used to being in Country Girls. Funakki feels like she’s talking more with the others when they’re in their dressing room. In the past, she’d only give curt greetings such as ‘Good morning’ or ‘Right’, but now she feels that she’s gotten more used to the situation. At first, Yanamin thought that Country Girls were quiet and peaceful. Yet now, she thinks that they’re a lively bunch, in the best sense of the word. While she was nervous about breaking the atmosphere, they’ve had more opportunities to work together recently through activities like this radio show, so she feels like she’s gotten used to chatting with the Country Girls senpai.